GASSER CHAIR EXPRESSLY RESERVES THE RIGHT TO UPDATE OR MODIFY THESE TERMS AT ANY TIME WITHOUT PRIOR NOTICE. YOUR USE OF THE GASSERCHAIR.COM SITE FOLLOWING ANY SUCH CHANGE CONSTITUTES YOUR UNCONDITIONAL AGREEMENT TO FOLLOW AND BE BOUND BY THE TERMS AS CHANGED. BECAUSE OF THIS, GASSER CHAIR REQUESTS THAT ALL USERS REVIEW THIS POLICY WHENEVER YOU USE THIS SITE. At our Site, Gasser Chair does not collect personal identification information from you unless you provide it to us voluntarily and knowingly. You can visit our Site without telling us who you are or revealing personal information. However, if you specifically agree to provide us with identifiable information, such as by asking to be put on our mailing list, we may contact you from time to time. Like many companies, we sometimes use “cookie” technology on our Site. These cookies are stored on your computer by your browser. When you log in, this cookie tells us whether you have visited us before or are a new visitor. The cookie does not obtain any personal information about you or provide us with any way to contact you, and the cookie does not take any information from your computer. We do use the cookie to help us identify Site features which you have the greatest interest. This may help us decide to provide more information and detail. Reasonable security measures are in place at Gasser Chair to protect against the loss, misuse or alteration of information collected from you. If you feel that this Site is not following this security policy, we urge you to contact us immediately at the address or telephone number at the end of this Policy. Unless otherwise noted, all materials, including, without limitation, all images, texts, designs, photographs, video clips and written materials that are part of this Site are copyrights, trademarks, trade dress and/or other intellectual property owned, controlled or licensed by Gasser Chair and are protected by U.S. and international copyright and trademark laws. Gasser Chair expressly reserves all intellectual property rights in all texts, images, products, technology, content and other materials that appear on this Site. Access to this Site does not confer and shall not be considered as conferring upon anyone any license under any of Gasser Chair’s intellectual property rights. This Site is intended solely for personal, non-commercial use. You may not reproduce, publish, transmit, distribute, display, modify, create derivative works, sell or participate in any sale of or exploit in any way, and or in part, any of the contents of the Site or products displayed on the Site. In addition, you may not alter or modify any part of the Site. Gasser Chair expressly disclaims any responsibility for the accuracy, content, or availability of information found on websites that link to or from www.GasserChair.com. Gasser Chair encourages discretion when browsing the internet using Gasser Chair’s or anyone else’s services. Because some websites use automated search results or otherwise link you to websites containing information that may be deemed inappropriate or offensive, Gasser Chair cannot be held responsible for the accuracy, copyright compliance, legality, or decency of material contained in third-party websites; and you hereby irrevocably waive any claim against Gasser Chair with respect to such Sites. Gasser Chair cannot insure that you will be satisfied with any product or services that you purchase from a third-party website that links to or from this Site, since other websites are owned and operated by independent third parties. Gasser Chair does not endorse any of the merchandise, nor does Gasser Chair take any steps to confirm the accuracy or reliability of any of the information contained in such third-party websites. Gasser Chair does not make any representations or warranty as to the security of any information you might be requested to give to any third party, and you hereby irrevocably waive any claim against us with respect to such websites. We strongly encourage you to make careful investigation before proceeding with any online or offline transaction with any of these third parties. The terms and conditions of this Policy represent the complete agreement between the parties and supersede all prior agreements and representations. If any provision of this Policy is held to be unenforceable for any reason, such provision shall be reformed only to the extent necessary to make it enforceable and the other terms of this Policy shall remain in full force and effect. The failure of Gasser Chair to act with respect to a breach of this Policy by you or others does not constitute a waiver and shall not limit Gasser Chair’s rights with respect to such breach or any subsequent breaches. The terms of this Policy shall be governed by and construed in accordance with the laws of the State of Ohio, without giving effect to any principles of conflicts of law. You further agree that the Site shall be deemed a passive website that does not give rise to regional jurisdiction over Gasser Chair either specific or general, in jurisdictions other than Ohio, that any action at law or in equity arising out of or relating to these terms shall be filed only in the state or federal courts located in Ohio, and you hereby consent and submit to the personal jurisdiction of such courts for the purposes of litigating any such action. If this provision is deemed unlawful, void, or for any reason unenforceable, then it shall be deemed severable from these terms and shall not affect the validity and enforceability of the remaining provision. Users are prohibited from violating or attempting to violate the security of the Site, including, without limitation: (a) accessing data not intended for such user or logging onto the server or an account which the user is not authorized to access; (b) attempting to probe, scan or test the vulnerability of the system or network or to breach security or authentication measures without proper authorization; (c) attempting to interfere with service to any user, host or network, including without limitation, via means of submitting a virus to the Site, overloading, “flooding,” “spamming,” or “crashing;” or (d) sending unsolicited email, including promotions and/or advertising of products or services. Violations of system or network security may result in civil or criminal liability. Gasser Chair will investigate occurrences that may involve such violations and may involve and cooperate with law enforcement authorities in prosecuting users who are involved in such violations. All comments, feedback, letters, suggestions, ideas and other submissions disclosed, submitted or offered to Gasser Chair on or by this Site or otherwise disclosed, submitted or offered in connection with your use of this Site, shall be and remain the property of Gasser Chair. Such disclosure, submission or offer of any comments shall constitute an assignment to Gasser Chair of all rights, titles and interest in all copyrights and other intellectual property. Therefore, Gasser Chair will own exclusively all of these rights, titles and interest and shall not be limited in anyway in its use, commercial or otherwise. 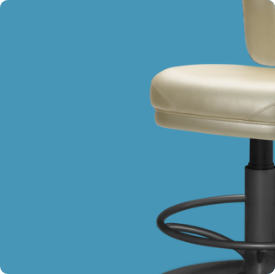 Gasser Chair is and shall be under no obligation to maintain any comments in confidence, pay the user any compensation for the comments, or respond to any of the user’s comments. Gasser Chair will be entitled to use, reproduce, publish, disclose and distribute any comments or materials you submit for any purpose whatsoever, without restriction and without compensation. Therefore, do not send us any comments that you do not wish to assign to us, including any confidential information or any original creative materials such as product ideas, artwork or suggestions for ornamental designs to be used with our products. You agree to defend, indemnify and hold Gasser Chair harmless from and against any and all claims, damages, costs and expenses, including attorneys’ fees, arising from or relating to your use of the Site. These terms are effective unless and until terminated by either you or Gasser Chair. You may terminate this Agreement at any time, provided that you discontinue any further use of this Site. Gasser Chair also may terminate this Agreement at any time and may do so immediately without notice and accordingly deny you access to the Site. It is Gasser Chair’s sole discretion to do this should you fail to comply with any terms and provisions of this Policy. Upon termination, you must promptly destroy all materials downloaded or otherwise obtained from this Site, as well as all copies of such materials, whether made under the terms of this Policy or otherwise. We have made every effort to display as accurately as possible the color and design of our products that appear on the Site. However, as the actual colors you see will depend on your monitor, we cannot guarantee that your monitor’s display will be accurate. Further, because of our ongoing commitment to product quality and innovation, we reserve the right to change or discontinue any specification, design, feature or model shown, listed or referred to on this Site without notice or obligation. DISCLAIMER THIS SITE IS PROVIDED BY GASSER CHAIR ON AN “AS IS” AND “AS AVAILABLE” BASIS. GASSER CHAIR MAKES NO REPRESENTATIONS OR WARRANTIES OF ANY KIND, EXPRESS OR IMPLIED, AS TO THE INFORMATION, CONTENT, MATERIAL OR PRODUCTS ON THIS SITE. TO THE FULL EXTENT PERMISSIBLE BY APPLICABLE LAW, GASSER CHAIR DISCLAIMS ALL WARRANTIES, EXPRESSED OR IMPLIED, INCLUDING, BUT NOT LIMITED TO, IMPLIED WARRANTIES OF MERCHANTABILITY AND FITNESS. SOME STATES DO NOT ALLOW LIMITATIONS ON HOW LONG AN APPLIED WARRANTY LASTS, SO THE FOREGOING LIMITATIONS MAY NOT APPLY TO YOU. YOU EXPRESSLY UNDERSTAND AND AGREE THAT UNDER NO CIRCUMSTANCES, INCLUDING, BUT NOT LIMITED TO, NEGLIGENCE, SHALL GASSER CHAIR BE LIABLE FOR ANY DIRECT, INDIRECT, PUNITIVE, INCIDENTAL, SPECIAL, CONSEQUENTIAL OR EXEMPLAR DAMAGES, INCLUDING, BUT NOT LIMITED TO DAMAGES FOR LOSS OF PROFITS, GOODWILL, USE, DATA OR OTHER INTANGIBLE LOSSES RESULTING FROM: (A) THE USE OF, OR AN ABILITY TO USE, THE SITE; (B) STATEMENTS OR CONDUCT OF ANY THIRD PARTY ON THE SITE; OR (C) ANY OTHER MATTERS RELATING TO THE SITE. APPLICABLE LAW MAY NOT ALLOW THE LIMITATION OR EXCLUSION OF LIABILITY FOR INCIDENTAL OR CONSEQUENTIAL DAMAGES, SO THE ABOVE LIMITATION OR EXCLUSION MAY NOT APPLY TO YOU. IN NO EVENT SHALL GASSER CHAIR’S TOTAL LIABILITY TO YOU FOR DAMAGES, LOSSES AND CAUSES OF ACTION, WHETHER IN CONTRACT OR TORT, INCLUDING, BUT NOT LIMITED TO, NEGLIGENCE, OR OTHERWISE, EXCEED THE AMOUNT PAID BY YOU, IF ANY, FOR THE PURCHASE OF ANY OF OUR PRODUCTS AS A RESULT OF YOUR VISIT TO OUR SITE. You affirm that you are older than eighteen (18) years of age, and are fully able and competent to enter into and follow these terms, conditions, obligations, affirmations, representations, and warranties set forth, and to abide by and comply with these terms. If you have any questions about this Policy, you can contact us via email (sales@GasserChair.com) or telephone us at (800) 323-2234. For postal mail, please write to us at Gasser Chair Company, Inc., 4136 Loganway, Youngstown, Ohio 44505.